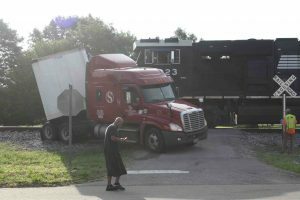 Thursday morning at 7 a.m. a tractor-trailer truck driver was looking for AMS supply in Bear Creek and decided to cross the railroad tracks to turn his rig around. The first crossing was successful but in an attempt to cross back onto Highway 13 the undercarriage or landing gear of his trailer hung up on the Gin Street crossing. 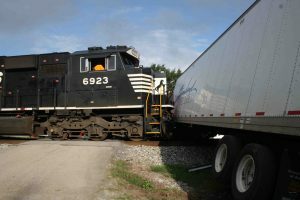 The driver got out of the truck and was across the highway about to call for help in when a single engine north-bound Norfork Southern train rounded the curve and saw the stranded truck. The engineer applied brakes and witnesses said it looked like a slow motion crash. No one was injured. Once the train was backed away, the truck was successfully freed by Lyle’s wrecker service. Please join us at Lakeland Community Hospital for this important end of summer blood drive on the bloodmobile: Friday, August 19 10am to 2pm, 42024 Hwy 195, Haleyville. The American Red Cross continues to have an emergency need for blood and platelet donors to give now and help save patient lives. All blood types are urgently needed. o While thousands of people from across the country have responded to the emergency request for blood and platelet donations issued by the Red Cross in early July, a critical blood shortage remains. o All eligible donors are encouraged to make and keep blood and platelet donation appointments to help ensure blood is available throughout the rest of the summer to meet patient needs. o On average, the Red Cross must collect 14,000 blood donations every day for patients at about 2,600 hospitals and transfusion centers across the country. o The Red Cross is grateful to those who have stepped up to give this summer. Are dead trees or tree limbs threatening your home? Call TREES-R-US. The right equipment and trained personnel to clean up your yard or larger property, TREES-R-US. 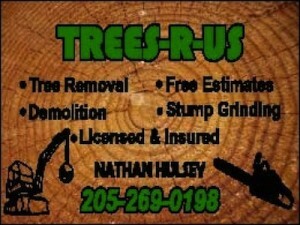 Call Nathan Hulsey on his personal cell, 269-0198 for a free estimate. Mention you saw it on hbtv.us. Nathan will treat your right and the price is right! The Haleyville City Council met Monday and approved the regular operating bills and purchase orders for July in the amount of $430,413.77. The non-educational tax abatement for American Manufacturing which had been previously discussed was approved for a 10 year period. The purchase of two police cars was approved from the low bidder, John Carpenter Ford in Moulton for a total cost of $46,930.44. The other bid was from Long-Lewis for $49,240.00. Mayor Ken Sunseri read a portion of the financial statements for the city’s fiscal year which ended September 30, 2015. The report highlights stated the City’s net position exceeded its liabilities by $8,221,607. At the government-wide level, total assets and deferred outflows of resources increased by $3,076,078 and total liabilities and deferred inflows of resources increased by $1,691,941 from the prior year. The City’s governmental funds reported a combined ending fund balance of $3,428,292, an increase of $431,539 from the prior year. The portion of the total ending balance that can be spent at the City’s discretion is $2,581,104 and is presented as unassigned fund balance in the governmental fund’s balance sheet. Total revenues for the City’s governmental activities increased by $199,267, or 2.5% from the prior year. The City recorded a gain on disposal of fixed assets of $1,247,269 which was largely due to the sale of the old City Hall building. Total expenditures for the City’s governmental activities decreased by $154,458, or 2.58% from the previous year. The majority of this decrease is due to lower interest costs due to the refinancing of long-term debt in the later part of the year. You can get a complete copy of the financial report with a request to city hall. The next meeting of the Haleyville City Council will be Tuesday, September 7, postponed from the day before because of Labor Day. 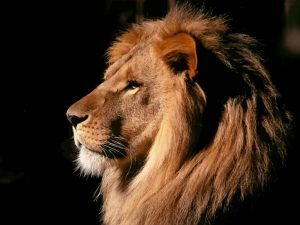 Meet the Lions is tonight at 7 p.m. at the HHS gym. All the members of the fall sports, coaches, band, and cheerleaders will be introduced. Haleyville High varsity football starts this Friday night against the Deshler Tigers in Tuscumbia. Kickoff is 7 p.m. You can hear all the Haleyville High Lions games this season with Butch Foster and Craig Wakefield bringing you the play by play. Eli Gold, the voice of the University of Alabama football live all season on Paradise 92.7. Today………please come out! The need is tremendous! 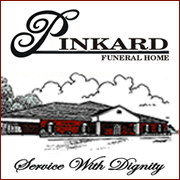 The drive runs 11:00 a.m. – 4:00 p.m. The blood inventory is currently at a critical level and every donor is needed. 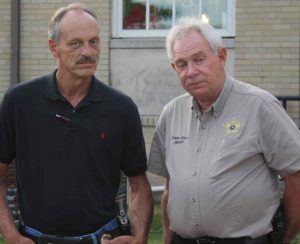 Two of the law enforcement officers who help keep us safe in Winston County is Haleyville Police Investigator Tim Steien and Winston County Sheriff Tommy Moore. The result of a recent study which places Winston County at number 5 on a good list was recently posted by Niche on the internet. Winston County made a top ten list which should make you feel a little safer. In a ranking of the safest counties in Alabama, Winston county was rated 5. The rankings were made from data from each county on the number of assaults, robbery, murder, burglary, vehicle theft and larceny. Limestone County was rated the safest. A link to the Al.com story is available on hbtv.us. Niche rates Alabama counties on other factors and Winston County received a C+. Slightly above average. 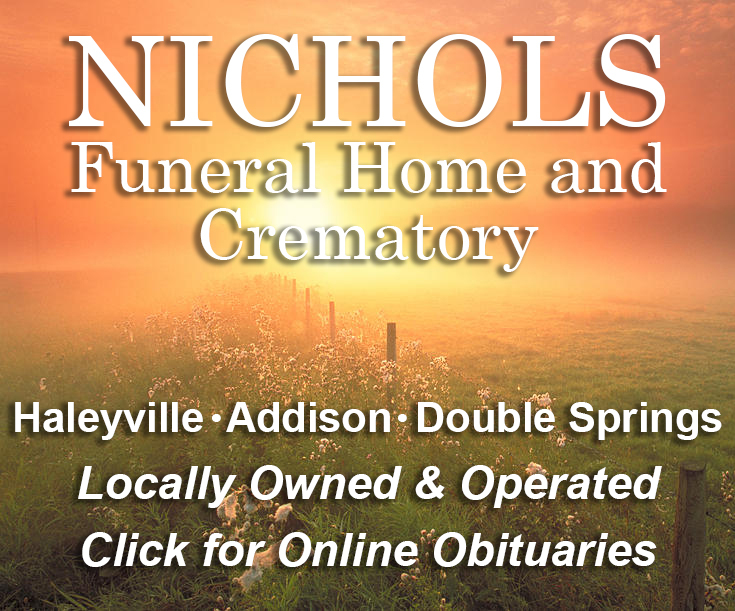 The Niche review stated Winston County has 24,256 residents. It has very low home values, very low rent costs, and average unemployment levels. 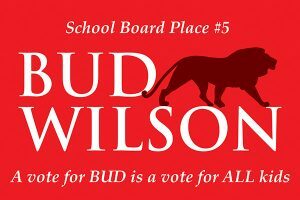 Its citizens generally have low education levels and low-income levels. At least, we can feel safe. 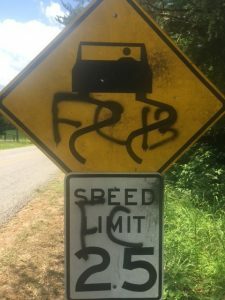 Haleyville Mayor Ken Sunseri has stated signs are being destroyed or defaced with graffiti. Hundreds of city dollars are spent replacing these signs. 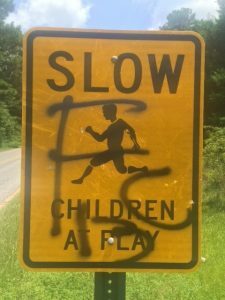 Please report anyone you see defacing a sign to the Haleyville police, 486-5201. Offenders will be prosecuted.